Beware. These are addictive. They seem quite innocent, sitting there with their unpretentious looks, but once you grab a few, you’ll be back for more. Perhaps more than you thought you would. Most recipes call for way too much sugar, I used just enough to give a hint of sweetness. They are more about spice. Not too much, though. Honestly, I think they are close to perfection, but feel free to change the proportion of spices, add different ones, and if that’s what rocks your boat, add more sugar. 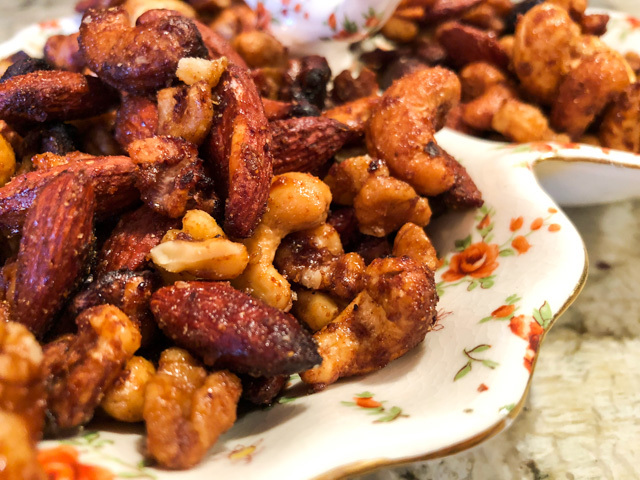 Just make sure to include the egg whites, they offer a natural “glue” for the spice mixture to adhere to the nuts, and a very delicate texture after baking. These keep well at room temperature, so they could turn into excellent gifts for the holidays inside a nice plastic bag with a cute bow. If you are into that sort of thing. Heat oven to 250 F. Lightly coat a baking sheet with oil spray. Combine all spices in a small bowl. Reserve. In a large bowl, whisk egg white with water until frothy, season with the teaspoon of salt and mix well. Add the nuts to the bowl, and combine everything well, mixing gently but thoroughly. Try to coat the nuts evenly with the egg white. Add the sugary and spice mixture. Spread over the prepared baking sheet and bake for about 45 to 60 minutes, moving it around every 15 minutes or so, until fragrant and starting to get golden brown. Remove from oven, let it cool completely, and break the pieces to serve. I like to transfer it to another baking sheet covered with paper towels so that it cools a bit faster and any excess fat is absorbed by the paper. 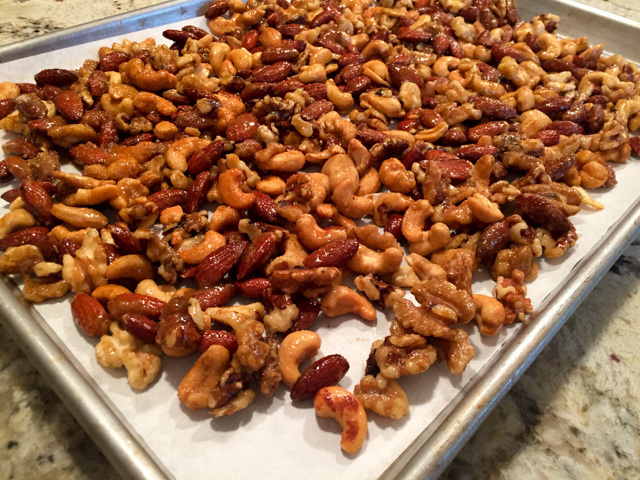 Comments: I made two batches of these nuts over the past few weeks. Once in a regular oven, once in the crock pot. Yes, you read that right, in the crock pot. The advantage is simply saving space in the regular oven, which was at a premium over Thanksgiving. So I opted to bake them in the slow-cooker, and there they sat, low and slow. You need to watch them a bit carefully after 45 minutes, because the sugar might start to stick at the bottom and get too dark. Just move them around and it will be fine. If using the crock pot, cook them on high for one hour, reduce to low and cook for another 60 to 90 minutes although they might be ready sooner, depending on the power of your gadget. Once they are ready, spread them on a baking sheet and let them cool completely. That is it. Nice and easy. I am inclined to say I preferred the texture when they cooked in the crock pot, but both methods ended up very similar. Oh no, you’ve discovered my Kryptonite! 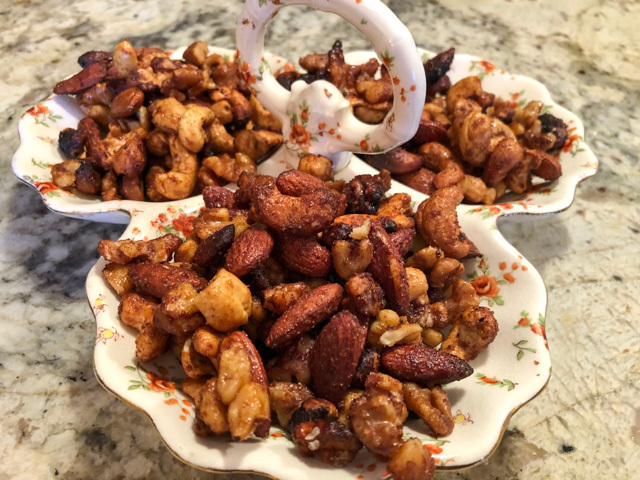 COCKTAIL SPICED NUTS WILL DESTROY ME!! Oh well. At least I’ll die happy. And full. Interesting to read you slightly preferred the crock pot version. I never would have thought of resorting to that. Kudos to you! well, you found out my secret! There are no secrets on the internet. I’d love to sit down with a big bowl of these tasty nuts. These look ultra-moreish right across the Pond! Don’t celebrate Christmas but that is not about to stop me from making a big bowl of these: curry and cinnamon: that’s a newbie for me . . .
Oh, I agree, these are much more up my alley during the season of indulgence (there’s only so much bread and constipating cheese I can take, lol, I’m sounding like the real golden ager that I am). 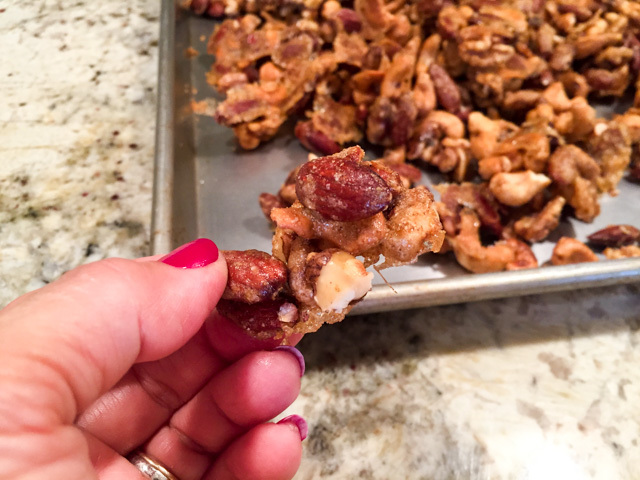 I had never thought about the egg white with spiced nuts… that’s such a great idea; I’m going to give it a try! In the company of olives too – YESSSS! Just wish we could be sharing a glass of bubbles together over your delightful nibbles Sally! wouldn’t that be great to be able to share them together? Loved the golden ager comment.. although I think I’m already passed that… copper? would copper do?